The city has taken a significant step forward toward the development of Sunnyside Yards, formally announcing a lead consultant to form a master plan and a steering committee comprised of local leaders to help shape it. Work on the master plan will begin over the summer, the city announced today, where it is anticipated to take 18 months to put together a framework for the 180-acre site–long slated for development. The plan is expected to delve into features like residential units, affordability, schools, parkland, and more at the site, along with development phases and a potential timeline to carry the plan out. The plan will be developed by a consulting team led by the Practice for Architecture and Urbanism. The team includes experts in structural engineering, landscape architecture, and financial and legal analysis. The consultants will work with the newly-formed Sunnyside Yard Steering Committee, an approximately 35-member panel that includes a medley of community leaders, local elected officials, and planning experts. Members from Community Board 1 and 2, local civic and education group heads, and transit advocates are just some of the stakeholders in the committee. The city’s Economic Development Corporation, the agency managing Sunnyside Yards’ potential development, made the joint announcement with Amtrak, which owns the majority of the yards. The national railroad company, which first approached the city about the project in 2014, recently signed a letter of intent to formalize collaboration on the master planning process with the city. The announcement comes just over a year after the Sunnyside Yard Feasibility Study was released. The study said over 80 percent of the yard could potentially be decked over and developed with up to 24,000 residential units, 19 schools and 52 acres of public parks. The EDC and Amtrak explained their reasons for wanting to develop the yards, and details on what the 18-month master planning process will look like. Cali Williams, the newly-appointed Director of Sunnyside Yard, a new role within the EDC, said developing the yards is needed to address a string of current and future infrastructure and affordability problems relating to the city’s continuing population growth. She said 80,000 more people are expected to live in Queens over the next 20 years—at a conservative estimate. While decking over the Sunnyside Yards is not a new idea, with concepts stretching back nearly a century ago, Amtrak officials say now is the right time to develop a plan, considering their own rail projects down the line. Williams added that the feasibility study showed rail lines place limits on what can be built at the yards, including buildings and open spaces. Additional rail infrastructure, she said, would make overbuild less feasible. The steering committee, co-chaired by Elizabeth Lusskin, President of the LIC Partnership, and Sharon Greenberger, President and CEO of the YMCA of Greater New York, will provide a “fresh perspective” on what can and should be built over the yards, not necessarily reflecting the scenarios of the feasibility study. The committee will first determine key areas of focus for the long-term plan and consider ways to engage the public in the process. The group will also hold quarterly meetings, where community voices will speak to neighborhood priorities while technical experts on the panel will translate voiced needs to the consultant team. 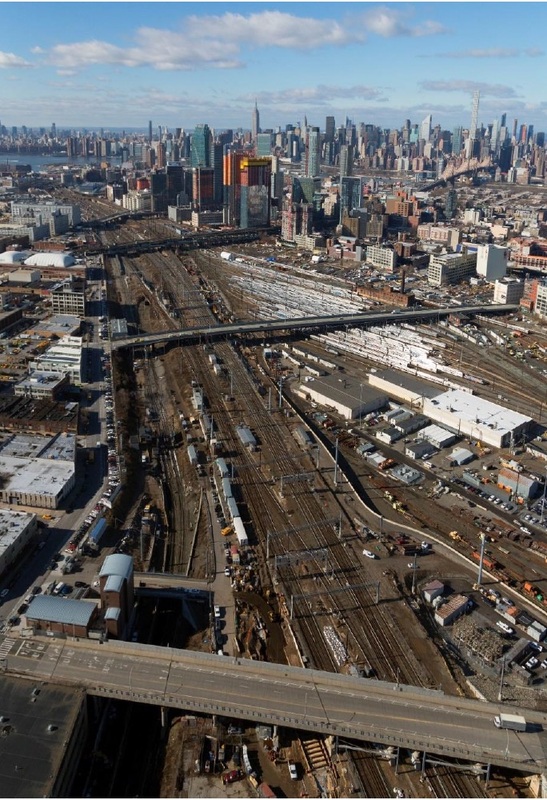 The Sunnyside Yards Director says there will be plenty of opportunities, whether through open houses, one-on-one meetings, and more, for the public to weigh in on the master plan. In addition, the EDC and Amtrak will seek to work with the MTA, which owns a significant portion of the yards, on the master plan and conversations on the project. The extent of the state-run MTA’s involvement so far in the project is unclear, but Governor Cuomo has repeatedly said no to the possibility. A spokesperson for the EDC added that all local elected officials at the city, state and federal levels have been invited to participate in the master planning. A set date or month in the summer for the master planning process’ kick off has yet to be released. While the process is expected to take 18 months, planning could take up to two years, according to the EDC. Amazon head quarters sounds really good on Sunnyside yard. Itwill bring lot of new business in queens. I hope Mr. Cuomo agrees. How about a new arena for the Knicks and Rangers? It ciuld be a 100,000 seat hockey/basketball arena. Offer the yards to Amazon as their new HQ2. Then everyone in the surrounding neighborhoods can be gentrified out. Cuomo will kill this just to keep the mayor’s hand out of the pot. Just wait and see. BUILD MORE SUBWAY CAPACITY! Do that first, and I might think that this was a good idea. As it now though, we already practically need crowbars or Japanese-style professional shovers to fit the existing ridership onto the 7 train. Adding a huge complex full of people like this (on top of all the building already going on) is going to turn an intolerable situation into an impossible one. This project is closer to the R than the 7. They are also supposedly already building a new LIRR station somewhere around there. If they made the port washington line a subway line, it would relieve a lot of congestion. You’d never get Manhasset and Plandome people on board with it though. for the benefit of the powerful members of lobby REBNY, not Queens, and covertly by big construction unions, whose NYTimes noted 40% feather bedding at public expense is a feature of East Side Access. A welcome proposal would be half park for the 200 acres, half affordable housing not tied to REBNY inflated AMI, and not tied to more luxury we do not need. See REBNY-driven overdevelopment of LIC. Any move forward not proceeded by first creating infrastructure is a blow to every Queens resident. Nothing is inevitable. At some point, they will need the support of Community Boards and local officials. Yo Patty D: I’m glad you back. I missed you. Peace my sistuh. The brothas love ya. How dare you? A community is made up of all kinds of people. Just because I would rather not have a bunch of self-important rich people around gumming everything up, I would never propose to bar them from somewhere because no one has the right to do that. No Tommy, Ann is right. We need another PJ like Queensbridge and Ravenswood. Those popping news you hear are from the champagne bottles being opened at REBNY headquarters. Is there a date and time set for Councilmember Van Bramer’s rally against this? I’ll attend all rally’s against this. – more living space for people who want to live and work in our city. We should be welcoming them! Building more homes is also the most effective way to decrease or at least stabilize rents and home prices for all New Yorkers. – decking over will contain or eliminate noise pollution from the yards like horn-blowing and the howling of the snow- and ice-melting turbine in the winter. – building over the yards will reduce the winds that build over the yards and hit the neighboring areas, sometimes carrying dust. Other than in the fever dream equations of economists, or in the minds of true believers of the libertarian faith, when has this ever proven to be true in the real world of NYC? Certainly not in my lifetime. Yet we keep building bigger, higher, and denser (and pricier) without doing much of anything to improve the transit, traffic, schools, and other infrastructure to support it. It was true until the 1960s zoning and the downzoning by Bloomberg. Housing prices will continue to climb as demand far exceeds supply. Now there is the issue where more housing induces demand by encouraging more people to move to the city, but in either scenario the only thing you can do is keep building. And destroying the fabric of neighborhoods, and overwhelming all of the public services, for the existing residents. Sounds like a plan to turn nice, attractive, reasonably human-scale, family neighborhoods into overcrowded hells. Rents have indeed been decreasing (slightly) in western Queens due to a large number of apartments hitting the market in LIC. The same has been observed recently in Brooklyn. However, with new construction not keeping pace with long-term demand growth, expect this to be a temporary phenomenon. In general, the city has created many reasons why construction costs are artificially high. High land values and the scarcity of buildable land are not the only reason. Agreed. The focus that folks have on the 7 train is misplaced in my view. This thing won’t go forward without the city making two minimal investments in a station for the new East Side Access tunnel and the Sunnyside Connector for Amtrak/NJT access to Penn Station. The 50,000 new people living there, plus many of the folks currently living in the new LIC developments would have to choose between a cramped slow ride into Manhattan on the 7 vs. a two-minute ride to Grand Central or the LIRR. And don’t forget the N and R are walking distance, and a quicker shot into Manhattan. How about creating a new extension of the 7 line that would go from Hunters Point station, through the railyards and on to 48th st? This mega project cannot be stopped. Our community leaders must minimize the negative impact to the surrounding areas. And, a big green space must be included. DD, you’re concerned about dust and noise pollution? Me too. Construction for this project will guarantee YEARS of both if it EVER gets approval. The 7 line cannot possibly absorb more riders. It is a disaster now. Not to mention other infrastructure. Horrible. They’d have to make a LIRR/Metro North stop and build the super express to JFK. This seriously needs to stop because the subway infrastructure can never support another population boom. Please forward this article to people who can stop the development. We the People can stop this! Any plan to build over the yard would have to include transit improvements. Thankfully metro North, the LIRR, Amtrak, and NJ Transit trains all pass through the yard already. There also has been plans for like fifty years to run a subway line through there. There’s been plans for 80 years to build the 2nd Ave subway. And, hey, look, they got 3 stops built! I don’t believe any long-term plans from the MTA. Even LIRR east side access, which connects the railroad to an already existing tunnel, has taken years longer (and cost billions more) than the lies they told us when they were planning the thing.